McKeefry Dental > Dental Treatments > What is dental erosion? 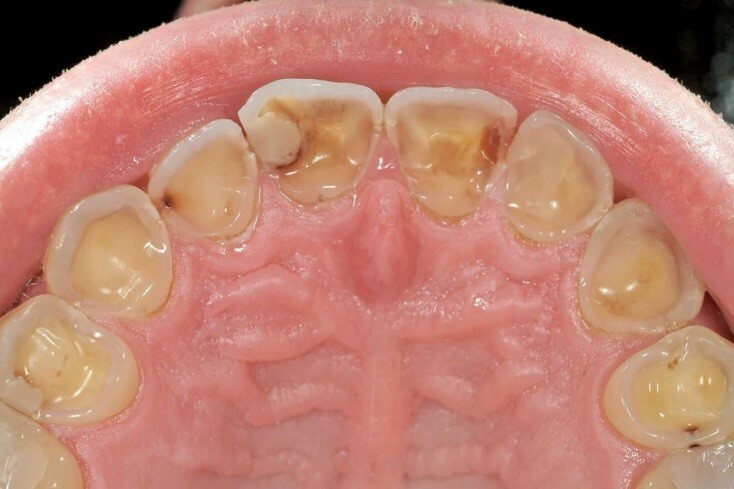 Dental erosion: what is it, what is it caused by, how can I prevent it, what can I do about it? Erosion is the loss of the surface of the tooth (dental enamel) due to acid exposure. Enamel is the hard-outer surface of the tooth which protects the sensitive inner layer (dentine) and the centre of soft tissue and nerves (pulp) and is what is seen when we smile. Loss of enamel from erosion can lead to sensitivity or pain. Erosion is generally a slow process that many people may not be aware of until the effects are significant. Unlike some other parts of the body, enamel can not regenerate or repair itself. This means once the damage has been done the enamel is lost forever. Erosion often appears as hollow pits on the biting surfaces or a shiny/glossy appearance to front and back surfaces of teeth. 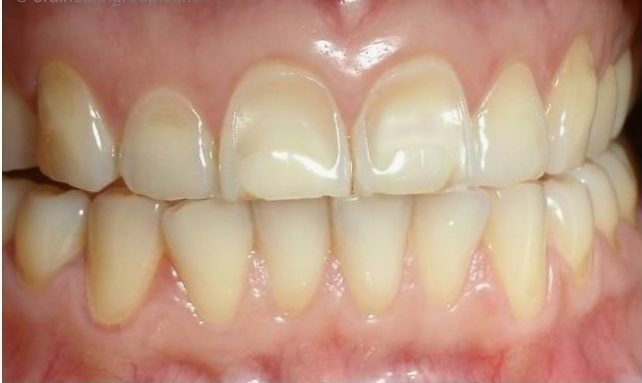 The teeth will often appear a lot more yellow or darker in colour – this is because as the enamel is lost the darker inner surface of the tooth (dentine) shines through. Acid, whether from the food or drink we consume (e.g. sugary/fizzy-drinks, juices, wine), or stomach acids in the mouth due to reflux or vomiting in eating disorders, is one of the biggest factors in dental erosion. Another big factor in the erosion process is frequency – the more we eat or drink acidic substances, the higher the risk of erosion is. While diet plays a major role in this, health issues like acid reflux can also be factors. For example, if you were to find a stone on the beach, it would feel smooth – this is because the waves have constantly washed over that rock and worn off/eroded any rough patches. This too applies to your teeth with acid constantly wearing at the protective layer of the tooth (enamel) until it is lost. 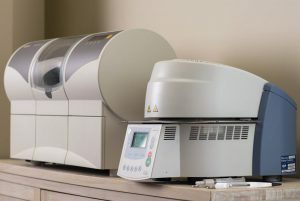 The pH scale measures the acidity or alkalinity of a solution – pure water has a neutral pH of 7, solutions with a lower value are more acid and solutions with a higher value are more alkaline. Drinks with a lower pH than 5.5 are considered comparatively acidic and may have high erosive potential, regardless of whether they are diet or sugar-free options. So just as we need to be conscious of sugars in our food and drink, we should be aware of the acidity of some common beverages. 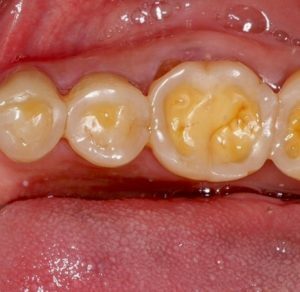 How can I improve my risk of dental erosion? If you’ve had an acidic substance in your mouth (for example, sipping on fizzy drinks/juices, drinking wine/beer, eating lots of fruit, or have had an episode of reflux or vomiting) do not go and brush your teeth straight away – even if this feels like the correct thing to do. Strange huh?! Your teeth have been bathed in acid and have softened/weakened because of this; if you then go and brush your teeth the enamel will wear a lot more easily. The best thing to do is rinse your mouth with tap water and/or smear some fluoride toothpaste over your teeth. You can also use a fluoride-based mouthwash. Try not to brush for at least 1 hour after. Limit the number of high-acid drinks/foods you consume. Chew sugar-free gum for 10 minutes after meals – this may help stimulate saliva to neutralise the acidity in your mouth. Finish each meal with a drink or rinse of tap water. Talk to your dentist/hygienist about products that can help stimulate your saliva and/or add more minerals back on to your teeth and into your saliva. See your GP if you think you may have acid reflux. There are a few ways in which we can treat erosion – firstly we need to stabilise your mouth and reduce acid erosion. 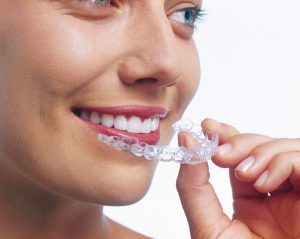 We will often take photos or measurements to help us monitor the progression or stability of the erosion in your mouth. 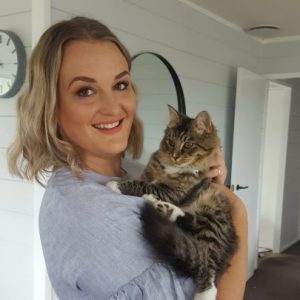 This may involve discussions around what and when you are eating/drinking, weighing up any medical problems you may have, and/or side effects of any medications you’re taking – there some medications which can cause or aggravate acid reflux. This is a set of tests we do in the clinic to test the amount of saliva you produce and its effectiveness in neutralising acid. Saliva can’t always combat acid erosion by itself and may need a helping hand to balance high levels of acidity. After assessing your mouth and any erosive risk factors you may have, we will often advise certain dental products for you to use at home to help strengthen your enamel, help desensitise your teeth, and/or improve the quality of your saliva. 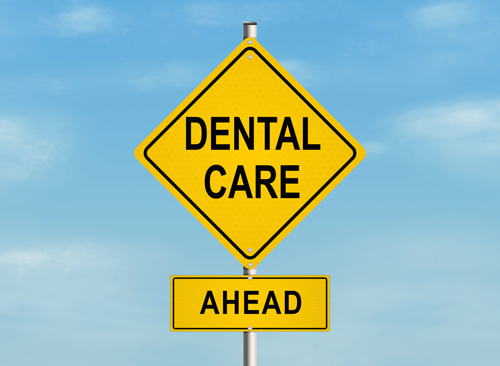 This may involve specific chewing gum, tooth mousse, high fluoride content toothpaste, products to treat dry mouth. In some instances we are able to place restorations over the affected area of a tooth to rebuild its natural shape and to help protect it from further erosion. This is something to be discussed with your dentist or dental hygienist. Erosion and wear from brushing of exposed root surfaces (from gum recession), dentine (inner layer of the tooth) exposed. Pulp (nerve) very close to the surface. Shiny/glossy/worn appearance to the front surface of front teeth. Erosion/wear to back surface of top teeth – typical of reflux, bulimia etc. Again, inner layers of the tooth are clearly visible.